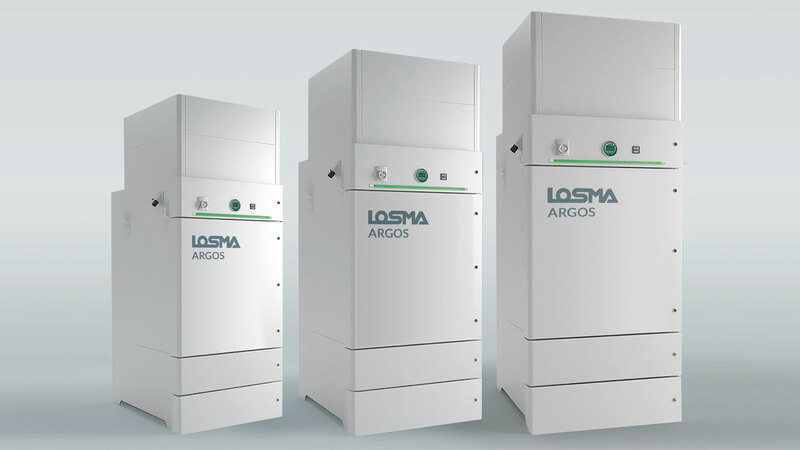 The new Argos series filters are designed for the filtration of oil mists (emulsion as well as neat oil), vapors and smokes deriving from machining processes. 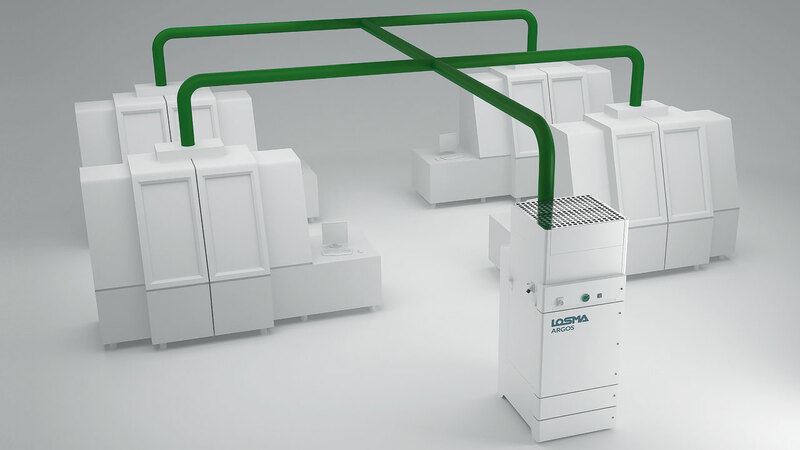 Designed for larger machine tools and centralised applications. 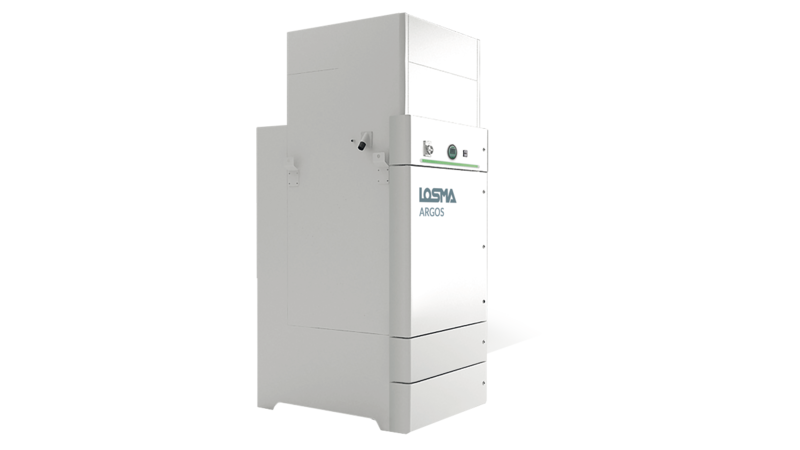 LOSMA grants that every single system is tested through strict control procedures. Every unit is provided with a qualitative and functional test certificate. With HEPA H13 post- filters reach an efficiency of 99,97%. Access to the filtration section is very easy and quick, without having to unscrew or disassemble anything. Simply unlock and open the hinged door to access the filters, which can easily be extracted and replaced in a short time. 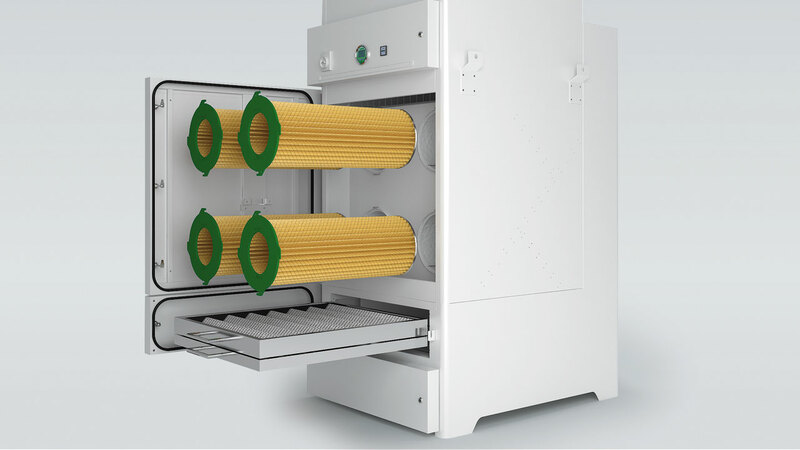 This filtration unit has purposely been conceived for the industrial sector, and its important features lie in its sturdiness, reliability and simplicity in conduction and maintenance. Available in 3 sizes with flowrates ranging from 3.000 to 15.000 m3/h and with increasing filtration efficiency rates to reach 99,97%. The air entry section, which connects the piping to the filter, consists in a large area which serves as a calming chamber (A). Inside this area a pre-blasting system “Twister” (B) (optional) can be provided, which further facilitates the aggregation of the finer particles by means of a forced centrifugal effect. Subsequently, the air passes through two separate and reusable filtration stages, a PVC drop separator and metallic G2 filter (C), with an efficiency of 80-90% following UNI EN 779. The next area consists of a chamber which houses the filter elements, cartridges with folds (D), with a high filtration surface which withholds the finer impurities. These cartridges are covered by a highly absorbent, coalescent filter which also allows for an even distribution of the air flow over the entire cartridge. This filter has a filtration efficiency of F5, namely 40-60%, while cartridges have an efficiency of F9 about 95%. 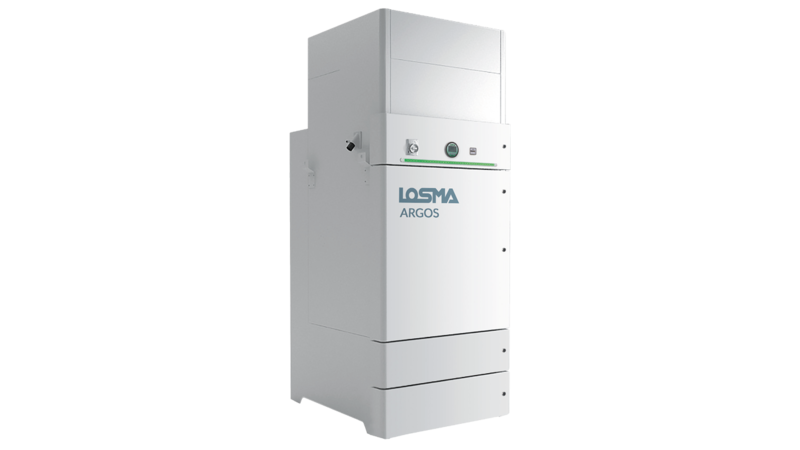 Argos is standard-equipped with a monometer to monitor the clogging of the filter elements. Upon request it can also be provided with a digital display to visualize the main functions and the exclusive system “LED UP”, which signals the clogging of the filter elements by means of three different colors. 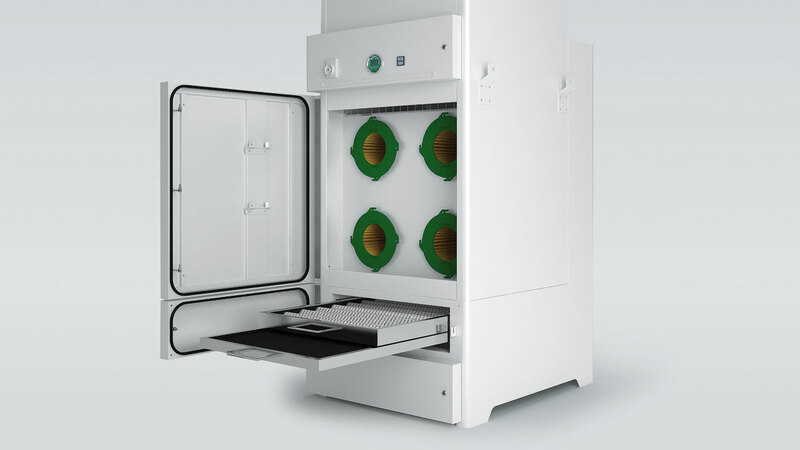 Access to the filtration chamber is possible through a hinged door, the horizontal positioning of the cartridges allows quick and easy access and maintenance. 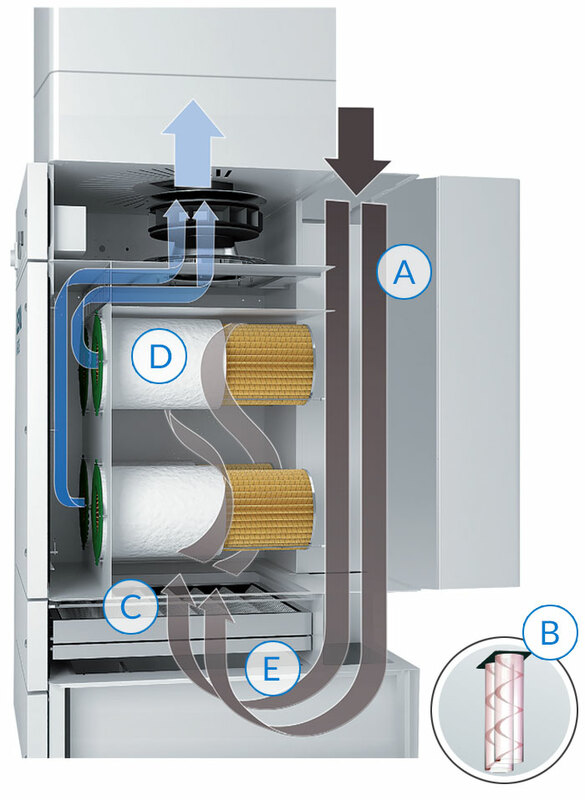 Removal of the filters is simple, fast and clean because the two chambers of filtration system are separate by a panel which also serves as a support structure for the filter elements. The recondensed oil mist particles are collected in a large tank, which includes an external visual level and a pump to automatically remove the collected liquid (E). To obtain a very high filtration level, 99.97% according to norm EN 1822. Particularly suitable for micro mists and smokes. Sistema che grazie alla combinazione di un pressostato digitale e una striscia LED di 3 differenti colori (verde, giallo e rosso), consente una facile e rapida visualizzazione dello stato di intasamento degli elementi filtranti. Pump including float for automatic emptying of the liquid collecting tank. Helicoidal system which forces a strong centrifugal movement of air, facilitating the aggregation of the oil micro particles.